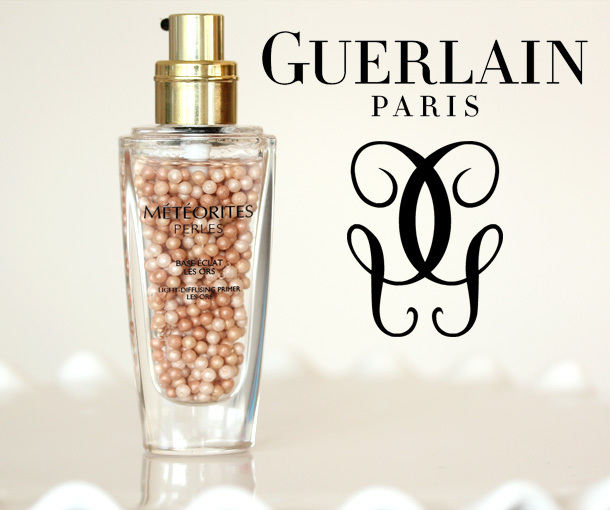 That’s what Guerlain’s new $71 MÃ©tÃ©orites Perles Les Ors Primer reminds me of — a snow globe. And meteoric pearls. Guerlain’s good about sumptuous details and design, aren’t they? I think it’s just neat, like makeup eye candy. Amazingly to me, the fragile little beads don’t break down in the gel. I guess they’re just waiting to be loved. The bottle comes with a pump. 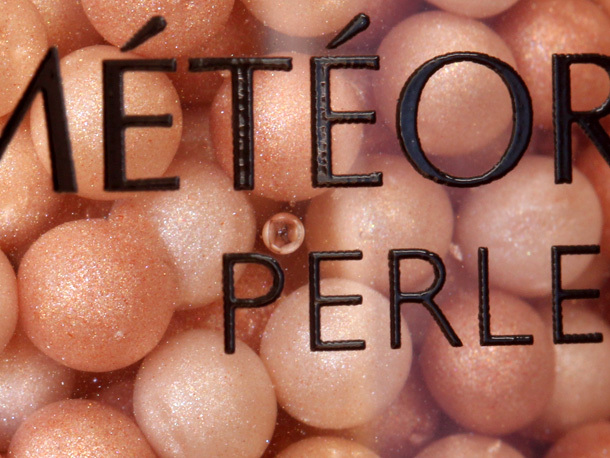 Pressing it magically mixes the pearls with the clear base, and out comes an oil-controlling shimmery pinkish golden gel. I think it works okay as a primer — maybe as a “diet primer” or “primer light.” It feels nice and light on my skin, which I like, but it is awfully expensive. 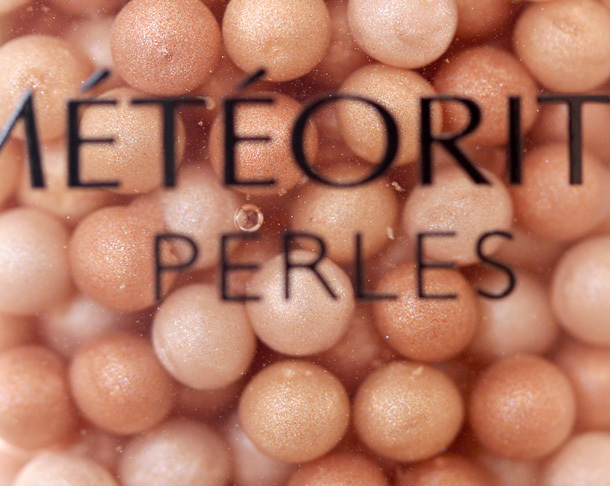 I prefer to use MÃ©tÃ©orites Perles Les Ors more to spotlight bare skin. The primer smooths and softens my pores and fine lines just enough — just shy of mannequin skin — and the pink and golden tones look breathtaking with just the faintest bit of bronzer dusted on top. Is it a summer must-have? Well, I think it might be if your skin’s already in great shape, and you really don’t need or want much coverage. I do have to say, though, that if I had to choose one big splurge product this season from Guerlain, I’d probably pick the Terra Nerolia bronzer instead… I just feel like it’s more practical. Maybe not quite as interesting or unique, but something I’d use more often. So I woke up in a strange way this morning. I was sleeping on my tummy (something I rarely do because I’m usually a back sleeper) when I felt something warm and heavy on my upper back. Apparently, Tabs was so desperate to get me up that he couldn’t wait until I rolled over, where he could climb up on my chest like he usually does, so he just settled for my back. How’s it goin’ today? Whatcha up to? I’m just doing the usual until this afternoon. Then I have a lady date at the frozen yogurt shop with my friend Marisol. I better hit the treadmill before I lose my willpower. It def looks beautiful but I think it’s too shimmery (I can’t believe I am saying this, lol). I’d prefer a bronzer instead. My day is going good although the rain made my freshly styler hair all frizzy, ugh, I hate that. I went out to breakfast with my friend and we ran to Ulta really quick and to Hallmark to pick up an anniversary card for the hubby. Now just chilling at home with a cup of coffee, Zumba later! Enjoy your froyo date, it sounds amazing right now. Happy Anniversary to you and your hubby! What will you guys be doing to celebrate? Ha ha, I know. I always have to wear something that shimmers, lol. Me too. I love my mattes but shimmers make everything better! Ooh, you have to let me know what he gets you. How long have you guys been married? This looks so nice in the packaging but it’s a shame that it’s just an okay primer. I do agree that the bronzers seem better. If you really wanted to, you could probably layer it with another primer. I do stuff like that all the time — mixing and matching. Kinda fun. Which of the bronzers caught your eye? This looks so pretty! I bet it would add great radiance underneath foundation! If only it wasn’t so pricey. Yay to froyo date! Have fun! Not doing much of anything around here today except work! Yes it would. It’s fairly subtle, but there if ya look. Work is always good (better than doing nothing). Got any plans for the weekend yet? You’re so funny! It feels great on the skin…you’ll love it. What a pretty and unique product! Too bad it’s not great as a primer. Ella is the cuddliest of my kitties, and I’ve had her jump up on my back before. She just settles in and starts purring! She’s friendly too and when we have friends over, she has no problem jumping on their lap. Does Ella start playing with your hair when she’s on your back? Ella has never played with my hair, she just wants to sit and cuddle. Sometimes she’ll tuck her nose in my palm or crook of my hand. It’s so cute! She’s also the furriest, so I too am covered in hair once she’s done. Thank goodness for lint brushes! Yes! I keep one in every room and TWO in my car, and it’s still not enough. I love cuddly kitties. Tabs is like Ella that way, but it’s funny because he’ll turn on you in a HOT second. A week and a half ago, he wasn’t into me at all and just kept biting every time I tried to pet him. But this week he’s all about mom! Maybe it’s because I switched him over the Fancy Feast Gravy Lovers. He’s a ho for that wet food! That’s so funny about Tabs. All of mine are pretty consistent with their behavior, but Mingy gets excitable when he’s outside. He knows when I need to take him inside and starts getting whiny. Mingy isn’t a lap cat, but when he’s relaxed he’ll flip over and let me rub his belly and under his chin. He’s a come a long way from being a street cat! When Tabs doesn’t want to come in he plops right down wherever he is and refuses to move. And when I carry him he’ll try to squirm away. Naughty kitty! Where did you find Mingy’s outdoor enclosure? I would like one eventually for our front yard. I got the enclosure from Amazon. If you search for “outdoor pet enclosure” it should come up with some options. I reccomend getting some tent stakes to secure it in the ground. Once Mingy once knocked it over when he tried to get out on his own. I hope you find something that works for you! They do have that power. Apparently sometimes, though, you can find their stuff at discounted stores. Who knew?! I use this daily and I love it! It’s super glowy without being glitter bombed… though I do love sparkle. And I do often layer High Beam on top of it. High Beam is fun. Do you ever wear Moon Beam? It’s awesome on the upper cheekbones. 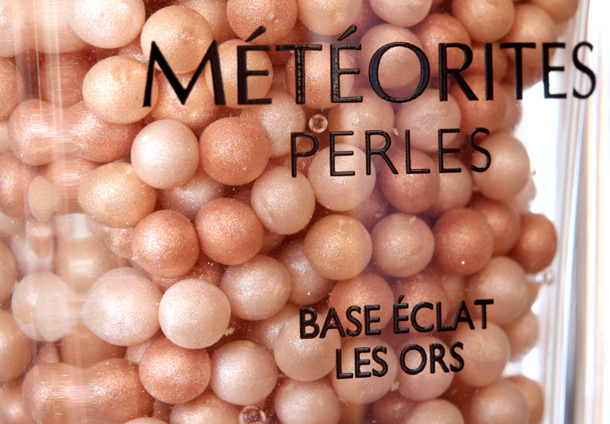 I’m a big fan of the Meteorites, but I haven’t tried a primer like this yet! Good to hear it’s probably not something I “need,” since my Guerlain summer wish list is getting awfully long with all the amazing stuff I’ve seen on you! Yes, the Guerlain summer collection is really beautiful. What’s on your list so far? Sooooo pretty. You are killing me with all these pricey lemmings recently! 🙂 what do you think is a better primer for minimizing pores? I love the shimmer of this one though. Mmmm now I want froyo! This makes me so sad. To see all that shimmery goodness, but know it doesn’t really do what it’s supposed to do. Sigh. Now on to the internal debate of whether or not to get it anyway–cuz I’m a total sucker for anything pretty and sparkly. This is one of those products that’s so gorgeous, it practically seduces you into buying it based on looks alone! I just cannot get past the price tag, though! Granted, I do use primer almost every day but until this earns an A++ rating from one of my most trusted makeup and beauty resources (you included, Karen! ), I can’t see it making it’s way home with me. I hope you had fun on your lady date! gosh i LOVE everything from Guerlain, and this is just too delicious to let up!!! ESP now that u’ve made me think of snow globes!!! It looks so pretty in the bottle I almost couldn’t bear to use it. But at $71 a pop… yikes, that would be a pretty paperweight! I wish I could justify it, but it doesn’t seem like a very useful product for me.